These notebooks/journals make a perfect student or teachers gift as well as a keepsake. Put the “fun” back in “functional” – make daily note-taking more enjoyable with customizable notebooks! 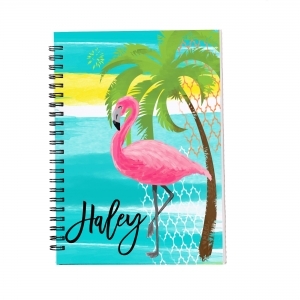 These practical notebooks can be personalized for professionals, students and writers of all personalities! Create one-of-a-kind gifts for kids with big and bold designs, or add a touch of class to these everyday items for those jotting down memos around the office. Order one for a friend and one for yourself too! Our spiral notebooks feature a customizable front panel and are printed on the front inside panel, back inside panel and back panel. The front and back of each notebook are made of flexi plastic and will not tear or wrinkle. The great little notebooks are have 60 lined doubled sided pages (120 total writing surfaces). Design is printed on front with your name.